Governor Sean Parnell has indicated that he intends to veto a significant number of projects in this year’s capital budget. That would be a mistake. Vetoing one-time capital investments is simply shortsighted. Government growth is driven by ever-increasing operating budgets, not capital expenditures. Individual vetoes may reduce spending this year but they do nothing to restrain the growth of state government and may actually hinder economic development. Alaskans can be confident that this year’s capital budget is targeted, appropriate and responsible. Capital spending stimulates private sector employment and has a tremendous impact on Alaska’s local economies. Those benefits can’t be underestimated. With a weak national economy, soft housing market and stagnant job growth, this year’s budget is especially critical. Last year, when revenue was tight, the Legislature trimmed Gov. Palin’s capital request by nearly $500 million, limited state spending to $488 million and delayed hundreds of critical infrastructure projects around the state. Two years ago, state capital spending totaled $2.3 billion. This year’s budget appropriates $2.05 billion, or $250 million less in state funds. Given last year’s minimal budget, this is a reasonable level of spending and well within historical norms. The Legislature has put a substantial amount of money in reserves. This session we set aside an additional $1.5 billion in savings and paid off the debt to the Constitutional Budget Reserve. Alaskans now have nearly $12 billion in savings with an additional $35 billion in the Permanent Fund. But at some point, growing cash reserves at the expense of making critical, multi-generational infrastructure investments is illogical. The state’s operating budget has more than doubled in the last 10 years, a rate of growth that far exceeds inflation, population or any other rational measure. This virtually guarantees that our savings will be quickly consumed by government benefits, programs and salaries. If the governor wants to make legitimate cuts in government spending, he needs to give more scrutiny to his administration’s $8 billion operating budget than he does to individual capital appropriations. I urge the governor to consider the separate and distinct role the Legislature plays in establishing Alaska’s financial priorities. This capital budget was developed with full public participation. These projects aren’t legislative priorities, they’re Alaska’s priorities. Legislative additions were vetted in an unprecedented, open and deliberative process. Supporting documentation for these projects is better than it’s ever been. Well before the budget was transmitted, the information was online and available for public review. This year more than 450 organizations — local governments, school districts, community councils and other groups — requested in excess of $3.7 billion for 1,700 individual projects around the state. Ultimately, it is the Legislature that has the difficult task of prioritizing among all these legitimate needs. This budget is a delicate political balance among equally important constituencies. I would note that nearly $2 billion, or 63 percent, of this year’s capital budget (including federal funds) is spending proposed by Gov. Parnell. While the Legislature scrutinized his spending proposal, we ultimately approved 100 percent of his request — not because we agree with everything in it but because we recognize how difficult it is to prioritize among all his agencies’ needs. Just as the governor relies on state commissioners to help determine government priorities, legislators rely on the councils, school boards and communities we represent. Heavy-handed vetoes this late in the process diminish our role and have the potential to create adversarial relationships among communities, neighborhoods and constituents across Alaska. I know Governor Parnell wants what’s best for Alaska. I trust that he will respect the legislative process and put Alaska jobs, households and the state’s regional economies first. I was saddened to hear of the passing of former Alaskan governor Wally Hickel this weekend. Governor Hickel’s leadership and vision resonate in many of the most significant milestones in our state’s history. Whether advocating for statehood or the development of our natural resources, he was an unmatched champion for Alaska and our unique way of life. I was fortunate to have met Governor Hickel when I came to the legislature six years ago and have benefited greatly from his perspective and advice. His passion, energy and dedication will be greatly missed. The Juneau Empire recently published a series of articles about the Alaska Mental Health Trust Authority’s proposal to develop a new state office building on their sub-port property in downtown Juneau. Given the heightened local interest in the issue and its potential impact on Juneau’s economy, I would have expected the Empire’s coverage to be more balanced and better researched. The financial details of the Trust’s proposal highlight the choice the legislature faced. The plan called for the state to spend $160 million over 30 years on a building it wouldn’t own. In addition to underwriting the $45 million construction cost, the state would have to agree to lease the land it’s built on and to pay twice market rates in rent. By ignoring these basic facts, the Empire leads Alaskans to erroneous conclusions about why the proposal failed and about my involvement in the process. The public expects the Finance Committee to distinguish political benefits from financial ones. The job demands that we take emotion and politics out of financial decisions and do what’s right for the state. Sound public policy dictates that we use universally accepted techniques to evaluate investments and that we examine every reasonable alternative. The Trust is a state corporation managed by an independent board of trustees. It operates much like a private foundation with the authority to spend Trust income without legislative appropriation. Trustees have a fiduciary responsibility to enhance Trust assets by earning the highest return possible for their beneficiaries. As Co-Chairman of the Senate Finance Committee I have a fiduciary responsibility to protect the state’s long-term interests. While we both endeavor to move the state forward, we may not always be able to use the same vehicle to get there. The initial objective was to stop leasing the 68,000 sq.ft. privately owned, Department of Labor building and to help Juneau’s downtown core in the process. That seemed to dovetail nicely with the Trust’s interest in developing its vacant sub-port property. However, from the state’s perspective, these are independent decisions. This is a financial transaction between a real-estate developer and a tenant and all proper due diligence must be applied. To justify developing its valuable waterfront property, the Trust needed a high quality building with a much larger footprint than the Department of Labor’s 300 employees required. If the state vacated the Douglas Island and Public Safety Buildings, the new building could then be expanded by 48,000 sq.ft. to accommodate those 220 additional employees. But, the state owns those two buildings, operates them very inexpensively and would be immediately disadvantaged were they vacant. Under the plan, the Trust would fund half the $45 million construction cost with the state issuing bonds for the balance. However, Trust assets are managed by the Permanent Fund Corporation with an expected rate of return of 8%. Before investing Trust money into the subport building, Trustees needed assurances that the investment could generate comparable earnings over the long-run and that their annual operating income wouldn’t be compromised. The Memorandum of Agreement with the Trust Land Office was clear, “the rental agreement, including rental rates, must be in the best interest of the Trust and its beneficiaries”. Unfortunately, as the building’s sole tenant, the state would have to provide those assurances. To guarantee the Trust an annualized 7.5% return on their investment, plus $1.0 million in operating cash flow and service its $23 million in bond debt, the state would have had to sign a 30-year lease. To make those numbers work, the state’s $5.4 million lease payment included an annual land lease of $750,000. The state’s lease payment would be twice what it is spending on the three buildings it currently occupies. $5.4 million equates to more than $4.00 per sq.ft. The state’s current Department of Labor lease is just $2.33 and the owners have offered a 10-year extension at $2.00. The average cost of a state-lease in Alaska is closer to $2.00. The most expensive state-lease in Juneau is less than $3.00. In the end, this deal was structured to achieve the Trust’s financial objectives, not the state’s. The present value of the imbedded land lease alone is $14.5 million. While the state has a moral and legal responsibility to support the mission of the Trust, we shouldn’t be subsidizing its venture capital investments. The proper place for the state to fund Trust beneficiaries is in the annual mental health budget which exceeded $200 million this year. I recognize that some of the facilities the state occupies in Juneau are aging and will need to be replaced. This year, I supported a $5 million appropriation to begin an orderly process for acquiring a new state office building. I look forward to working with the community and its delegation to achieve that goal. 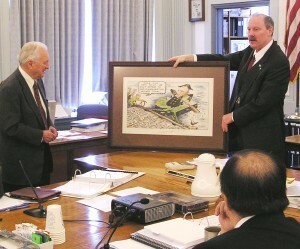 The supporting back-up for the FY2011 Capital Budget was sent to the governor today for his review. As co-chair of the Senate Finance Committee I helped manage the appropriations process and worked with colleagues to construct the Capital Budget. We approached this year’s budget with three objectives in mind: save before spending, put Alaskans to work, and address our state’s significant infrastructure needs. Alaskans can be confident that the budget we’ve sent to the Governor is responsible and will improve the quality of life in our state. I’m pleased with the legislature’s work and hope these projects will advance economic development in our state. Here’s a list of projects in Senate District A included in the budget.